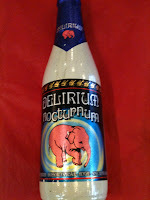 Deveneys of Dundrum: Delirium Nocturnum - definitely. I'm a firm believer in ''if you can't afford it͵ don't fake it''. I've never been an advocate of counterfeit Louis Vuitton handbags nor am I in a position to afford a real one but despite this having the look of a ceramic bottle and disappointingly only painted. We've decided not to hold it against the overall package - This is a beer worth purchasing͵ a couple of times. It pours a murky brow colour with a frothy cream head. The nose is beautiful - can I use that adjective?͵ it deserves it!!! Both myself and Karl on the scooter agree on Vanilla essence͵ banana͵ bubblegum and malt. The palate has this lovely carbonation͵ a good fine sparkle͵ something similar to a Frizzante fizz. The palate displays malt and ripe fruit flavours with this delicious balanced sweetness and a Ryvita/ malt finish. You may ask͵ ''What's the deal with the pink elephant?''. This is a euphemism for drunken hallucination. The astute John London diagnosed us all͵ for the first time in the early 1900's and we can raise a glass with thanks- we're not mad͵ just having a good time crazy!!! Ah, delerium tremens.... I ended up drinking a bottle of it at the end of a night in a Paris nightclub about ten years ago. They were turning on the lights so I had to get it down faster than anticipated: Oops- I failed to notice that it's pretty strong. It was an 'interesting' trip back to my hotel. Was just in this evening and bought a bottle of Hop Devil IPA. Expensive stuff - but well worth it, a fine biscuity example of its kind. Oops- Should have read more closely... This is Delerium Nocturnum. Same brewey at least!